A NASA Hubble Space Telescope (HST) view of the magnificent spiral galaxy NGC 4603, the most distant galaxy in which a special class of pulsating stars called Cepheid variables have been found. It is associated with the Centaurus cluster, one of the most massive assemblages of galaxies in the nearby universe. The Local Group of galaxies, of which the Milky Way is a member, is moving in the direction of Centaurus at a speed of more than a million miles an hour under the influence of the gravitational pull of the matter in that direction. Clusters of young bright blue stars highlight the galaxy’s spiral arms. In contrast, red giant stars in the process of dying are also found. Only the very brightest stars in NGC 4603 can be seen individually, even with the unmatched ability of the Hubble Space Telescope to obtain detailed images of distant objects. Much of the diffuse glow comes from fainter stars that cannot be individually distinguished by Hubble. The reddish filaments are regions where clouds of dust obscure blue light from the stars behind them. This galaxy was observed by a team affiliated with the HST Key Project on the Extragalactic Distance Scale. Because NGC 4603 is much farther away than the other galaxies studied with Hubble by the Key Project team, 108 million light-years, its stars appear very faint from the Earth, and so accurately measuring their brightness, as is required for distinguishing the characteristic variations of Cepheids, is extremely difficult. Determining the distance to the galaxy required an unprecedented statistical analysis based on extensive computer simulations. 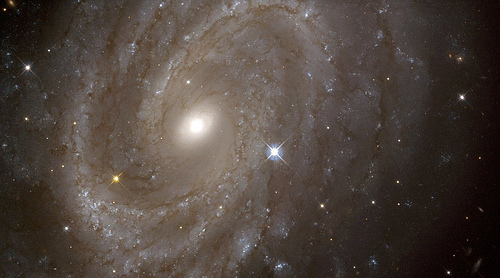 Edited Hubble Space Telescope image of a very pretty spiral galaxy. Original caption: A NASA Hubble Space Telescope (HST) view of the magnificent spiral galaxy NGC 4603, the most distant galaxy in which a special class of pulsating stars called Cepheid variables have been found. It is associated with the Centaurus cluster, one of the most massive assemblages of galaxies in the nearby universe. The Local Group of galaxies, of which the Milky Way is a member, is moving in the direction of Centaurus at a speed of more than a million miles an hour under the influence of the gravitational pull of the matter in that direction. Clusters of young bright blue stars highlight the galaxy’s spiral arms. In contrast, red giant stars in the process of dying are also found. Only the very brightest stars in NGC 4603 can be seen individually, even with the unmatched ability of the Hubble Space Telescope to obtain detailed images of distant objects. Much of the diffuse glow comes from fainter stars that cannot be individually distinguished by Hubble. The reddish filaments are regions where clouds of dust obscure blue light from the stars behind them. This galaxy was observed by a team affiliated with the HST Key Project on the Extragalactic Distance Scale. Because NGC 4603 is much farther away than the other galaxies studied with Hubble by the Key Project team, 108 million light-years, its stars appear very faint from the Earth, and so accurately measuring their brightness, as is required for distinguishing the characteristic variations of Cepheids, is extremely difficult. Determining the distance to the galaxy required an unprecedented statistical analysis based on extensive computer simulations. (May 1, 1999) A NASA Hubble Space Telescope (HST) view of the magnificent spiral galaxy NGC 4603, the most distant galaxy in which a special class of pulsating stars called Cepheid variables have been found. It is associated with the Centaurus cluster, one of the most massive assemblages of galaxies in the nearby universe. The Local Group of galaxies, of which the Milky Way is a member, is moving in the direction of Centaurus at a speed of more than a million miles an hour under the influence of the gravitational pull of the matter in that direction. Clusters of young bright blue stars highlight the galaxy’s spiral arms. In contrast, red giant stars in the process of dying are also found. Only the very brightest stars in NGC 4603 can be seen individually, even with the unmatched ability of the Hubble Space Telescope to obtain detailed images of distant objects. Much of the diffuse glow comes from fainter stars that cannot be individually distinguished by Hubble. The reddish filaments are regions where clouds of dust obscure blue light from the stars behind them. This galaxy was observed by a team affiliated with the HST Key Project on the Extragalactic Distance Scale. Because NGC 4603 is much farther away than the other galaxies studied with Hubble by the Key Project team, 108 million light-years, its stars appear very faint from the Earth, and so accurately measuring their brightness, as is required for distinguishing the characteristic variations of Cepheids, is extremely difficult. Determining the distance to the galaxy required an unprecedented statistical analysis based on extensive computer simulations.